Vaujany: Ski area both in winter and summer. Ideal for 2 families (sleeps 10 in total). Chalet made of wood with charming decoration. 5 bedrooms with double living room: 124-sq.m living area + 20-sq.m basement. Located 4 min away from L'Enversin lifts and the Vaujany cable car (shuttles in the morning and in the afternoon): access to the glacier in 20 min, 3330 m height, and the Grandes Rousses ski area, featuring Alpe d'Huez, Vaujany, Oz en Oisans, Villard-Reculas, and Auris en Oisans. Carefully decorated: this isn't your usual rental property décor. Instead, it's the ambience where all our passions are writ large: wooden cladding on the walls, wooden flooring upstairs, decorative furnishing, and high quality bedding and crockery. You will also find many appliances: everything, even a percolator. You won't just feel like you are in just any mountain rental; you will feel right at home! To visit the chalet: Please visit our website. Vaujany is a ski resort that's out of the ordinary thanks to its architectural quality and amenities (pool, sauna, hammam, skating, bowling, tennis, etc.). It is located in Alpe d'Huez, and there is a cable car service. The ski area is ideal for beginners and experts, and there is a really natural ski run at the Grandes Rousses mountain range... And the cherry on top? La Meije is also nearby. We're talking about a connection with Les 2 Alpes. The Visalp package allows you to spend a day skiing in Les 2 Alpes or to go up La Meije. The chalet is cosy and spacious. Remember, we made it to enjoy ourselves as well! - The ski resort (equipment, ambience, and snow guaranteed with the glacier at an elevation of 3300 m and snow machines at lower heights that guarantee your descent back to the resort. - The many different ski runs and the off-piste options - The ski school whose courses are always reasonably priced and boasts top management - The quality of the lodgings and the kindness of our property managers, Thérèse and Pieter - The comforts of our holiday apartment: it's impossible not to love! TV, speakers and dock for iPod, board games, tourist guides, magazines, washing machine, tumble dryer, an iron and ironing board, dishwasher, microwave, oven, glass-ceramic hob, fridge-freezer, fireplace, etc. You will find everything just like home, right down to the espresso machine! When it's nice outside, dine on the picnic table on the vast panoramic terrace with a view of the Lake of Verney, the snowy peaks, and the bubbling brook that crosses the Grande Randonnée trail beneath the chalet. I have spent much of the season here in Jean-Yves' chalet in Pourchery, just outside Vaujany. I am happy you have enjoyed the chalet. It’s a family place and you have to know every time we have guest, we do our best you feel in your own chalet ! I hope I’ll see your family and your friends for another stay. En plus la neige était au rendez vous! Je vous remercie de votre démarche spontanée et de votre enthousiasme ! Nous sommes très impliqués pour que tous se passe pour le mieux... alors si en plus la neige était en abondance au rendez-vous ! 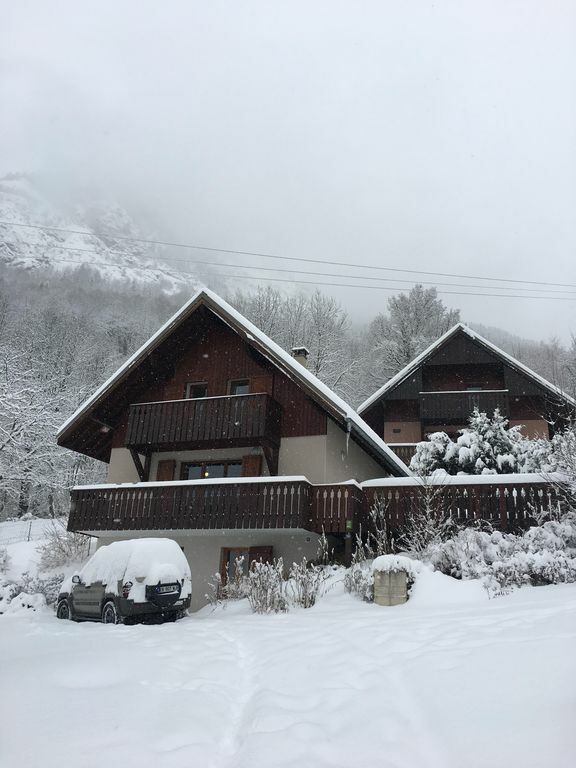 A very well equipped and comfortable chalet - we had a lovely week at Vaujany in spite of the poor weather. Lots to see and do in the area - excellent walks local to the chalet on well marked paths. Vaujany is a delightful Alpine village - with good small shops and there are several good restaurants in the surrounding villages. Would be happy to visit again. Le chalet se trouve en retrait de la route: il est au calme . Le confort est parfait avec ses 2 salles de bains et toilettes séparées. La décoration est chaleureuse; on s'y sent bien. L'espace cuisine salon du rez de chaussé nous a emballé : beaux fauteuils en cuir, canapé, table basse pour nos apéro du soir ( nous étions 9). C'est spacieux, on s'y sent bien. Et tout ça a quelques minutes de la station. Je suis heureux que vous appréciez le chalet, j'avoue que je décrirai de manière un peu similaire "les bonnes vibrations" quand nous nous y trouvons en famille et entre amis! Je vous dis donc bien volontiers à l'année prochaine. Ce chalet est bien pensé, fonctionnel et agréable à vivre pour des vacances en famille. Ambiance cocooning assurée avec le poêle et la décoration raffinée. Nous avons passé une très bonne semaine de Noël et avons même pu profiter de la terrasse ensoleillée. Vos impressions nous vont droit au cœur car elles correspondent à l'énergie et l'envie que nous mettons dans la mise à disposition de notre chalet familial ! J'espère très sincèrement revoir votre famille dans notre chalet et faire votre connaissance. 45 min away from Grenoble and 1h 30 min away from Lyon. Grandes Rousses ski resort: Alpe d'Huez, Vaujany, Oz en Oisans, Villard-Reculas, and Auris en Oisans. There are a total of 250 km of ski runs, with 8000 m of slopes in 4 descents from Mont Blanc (altitude:3330 m). Packages are available for families and students. Online booking is available for SPL Oz-Vaujany or Sataski so that you don’t have to wait. The Grandes Rousses' package includes a one-day access to Les 2 Alpes ski resort (25 min away by car to the Venosc aerial lift), the opportunity of skiing at Vallons de la Meije, the largest ski run in Europe You can also access Alpe du Grand Serre, Chamrousse and the Italian Via Lattea. A Visalp weekly pass will allow you to access the pool, the fitness centre and the ice rink in Vaujany. Skiing: Discounts on ski rental and package offers: please contact us.